If you know my family personally and have spent time on Instagram, you’ll understand how near and dear to my sister’s heart hiking is. Which is why, during the entire six months that I’ve lived in this country, she’s often asked me why I haven’t been going off on nature treks of my own. I enjoy hiking but I also like to find excuses for plans that involve commitment. Organized by our school director, the opportunity to hike into Tenorio Volcano National Park and see some of the beautiful, damp scenery that Costa Rica is known for came about. With included transportation and the comradery of my coworkers and friends, not even a social escape artist like myself could duck out of the trip and I’m thankful for how it unfolded. The terrain wasn’t too difficult but a downpour in the middle of the hike made for slippery and muddy footing. Despite the heavy raindrops, bug bites and a few falls in the mud everyone in our group shot smiles to each other from underneath rain poncho hoods. 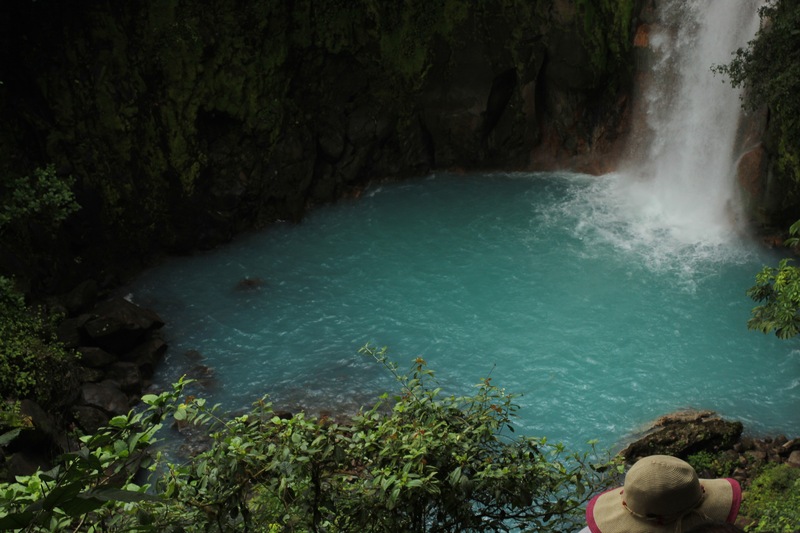 The main draw of this hike is a confluence of streams whose chemical combinations make the water bright turquoise. The science behind all of this is a bit beyond my knowledge, but this post does a decent job of probably explaining the phenomena. Many signs are posted in the park telling visitors that swimming isn’t permitted. I’d be surprised if the humidity, partnered with the allure of neon water, hasn’t caused a hiker or two to disobey these rules. However, once I got close enough to take in the smell that’s released from the water and lingers under the canopy, I felt quite content just observing from under my hood. Think Lithia fountains times 10. Just as we finished , the sun came back and we peeled off our layers. I was nodding off in the shuttle both times our driver stopped abruptly on the road out. The first was for a group of toucans that were jumping from branch to branch on the side of the road. The second time, I thought he was just messing with us but continued to point up about thirty feet in a tree, his eyes not moving from one spot. I squinted hard and was able to see my first sloth in the wild. A kind of furry wad just hanging there from a branch and occasionally only moving its head. It appeared calm and unbothered as it watched us watch it. When we drove away, I wondered how many times during these six months I’d missed seeing sloths, due in part to their natural camouflage but also to my tendency to opt out of cool opportunities like that hike. Hikes with friends are fun and sloths are dope as hell, I hope to not miss another chance like this during my time here.